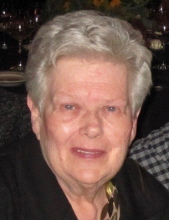 Joan Helen Pietrasz, age 81, of Rossford, Ohio passed away on Wednesday, April 10, 2019 at Hospice of Northwest Ohio in Perrysburg. She was born on October 12, 1937 in Toledo, Ohio to Harry and Helen Michalak. Joan was a 1955 graduate of Central Catholic High School and attended Davis Business College. She was a member of All Saints Catholic Church where she was active in the PTA and music ministry. She married Louis Pietrasz on May 17, 1958 and together they raised two daughters. Joan loved gardening and being surrounded by flowers, her favorites were gardenias and lilies of the valley. Her love of Polka music filled her home, especially on a Sunday afternoon. Polka dancing with her husband and their friends filled many weekends throughout her life. A favorite pastime of entertainment was laughing through episodes of “Everybody Loves Raymond” and the “Golden Girls”; although her favorite golden girls were first and foremost her six granddaughters. She will always be remembered for her un-ending love and pride she felt for these girls. She never failed to miss sending birthday cards and acknowledging special milestones of their lives. Through modern technology she was able to watch her three great-grandchildren grow. Joan will be deeply missed by her family and friends. Surviving is her loving husband of 60 years, Louis Pietrasz; daughters, Michelle (Jeffrey) Sabin and Julie (Silvio) Veluscek; granddaughters, Allie (Ben) Koger, Katie and Maggie Sabin, Alaina, Kaetlyn and Francesca Veluscek; great grandchildren, Evie, Maddie and Cameron Koger. Joan was preceded in death by her parents; and her brother, Harry Michalak, Jr.
Family and friends may visit at Sujkowski Walker Funeral Home, 830 Lime City Rd., Rossford, Ohio 43460 on Friday, April 12, 2019 from 5-8 PM. A Mass of Christian Burial will take place on Saturday, April 13 at 10 AM at All Saints Catholic Church in Rossford where the family will greet visitors beginning at 9 AM. Interment will follow at Ft. Meigs Cemetery in Perrysburg. The family would like to thank the Rossford E.M.S; the staffs at St. Vincent Medical Center, Hospice of Northwest Ohio and the Sujkowski Walker Funeral Home. Contributions in Joan’s memory may be directed to All Saints Catholic Church, Hospice of Northwest Ohio, the American Cancer Society or the charity of the donor’s choice. To leave expressions of sympathy for the family please visit www.walkerfuneralhomes.com. To send flowers or a remembrance gift to the family of Joan H. Pietrasz, please visit our Tribute Store. "Email Address" would like to share the life celebration of Joan H. Pietrasz. Click on the "link" to go to share a favorite memory or leave a condolence message for the family.